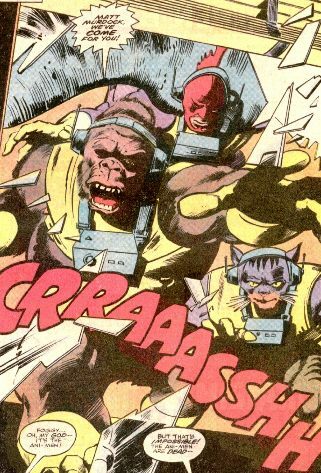 (Daredevil I#158 (fb) - BTS) - The Exterminator guised himself as Death-Stalker and equipped three new men with the Ape-Man, Bird-Man, and Cat-Man costumes. He offered them one hundred thousand dollars to kidnap blind attorney Matt Murdock. (Daredevil I#157 - BTS) � Ape-Man posed as a janitor and witnessed some Avengers leaving Murdock�s room. Later, after Murdock was released from the hospital, Cat-Man spied on Daredevil on the rooftop of Heather Gleen's apartment building, and not long afterward Bird-Man spied on Murdock kissing the tormented Heather Glenn. (Daredevil I#157) - The Ani-Men attacked Murdock's office, with his associates Becky Blake, Black Widow, Heather Glenn, and Franklin "Foggy" Nelson there. Bird-Man knocked Black Widow back with a punch. When Nelson hit Ape-Man with a chair, Ape-Man punched Nelson back. (Daredevil I#158) - Bird-Man was hit in the head by a nameplate thrown by Heather Glenn, allowing Black Widow to leap on him and rip his wings off. Ape-Man and Cat-Man, deciding to split the profits themselves, rushed Murdock across the city, ignoring his warnings that Death-Stalker was a killer. They returned him to the cemetery they'd been instructed to go to and Death-Stalker met them there. While they were counting their money, Death-Stalker walked up behind Ape-Man and Cat-Man and killed them both with a touch. (Captain America I#319) - Bird-Man was later killed by the Scourge. Comments: Created by Roger Mackenzie, Mary Jo Duffy, Gene Colan, and Klaus Janson. The real names of these characters were revealed in the OHOTMU Master Edition. Thanks to Madison Carter for helping with this profile. 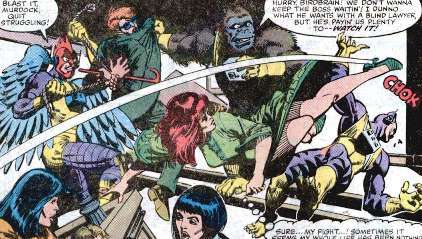 (Daredevil I#158) - Bird-Man was hit in the head by a nameplate thrown by Heather Glenn, allowing Black Widow to leap on him and rip his wings off. Ape-Man and Cat-Man, deciding to split the profits themselves, rushed Murdock across the city, ignoring his warnings that Death-Stalker was a killer. They returned him to the cemetery they’d been instructed to go to and Death-Stalker met them there. While they were counting their money, Death-Stalker walked up behind Ape-Man and Cat-Man and killed them both with a touch. 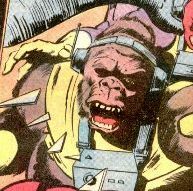 Ape-Man's suit gave him enhanced strength. Cat-Man's suit gave him claws and enhanced agility.